Having completed the manuscript for my second novel, The Prince of Glencurragh, which publishes this summer, I can take a break from my research reading to focus on the stack of historical novels that have been awaiting my attention for so long. I'm joining the Historical Novel Reading Challenge (a little late), and will be posting my reviews here over the next nine months. I invite you to take up the challenge as well, for historical novels are the best reading for those of us who like to learn while we're being entertained! Click the button below for more info on the challenge. I am right now reading M.L. Stedman's The Light Between the Oceans, and then will review Heyerwood, a novel by my new author friend Lauren Gilbert. Then comes The Miniaturist by Jessie Burton. After that, I'll be working on my Goodreads Wish List. If you've read any of the books I'll be reviewing, I'd love to see your comments here. Sharavogue is the award-winning novel of 17th century Ireland and the West Indies, available now on amazon.com and barnesandnoble.com. 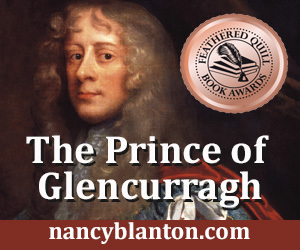 The prequel, The Prince of Glencurragh, will be available in summer 2016.